Llangrove village is positioned close to the southern boundary of Herefordshire about 17 miles south of the county town, Hereford. The A40 dual carriageway is two miles south-east at Whitchurch. The village forms part of the parish of Llangarron coupled with the villages of Llancloudy, Llangarron, and Three Ashes. Llangrove has around 200 homes of varying styles and ages. There is a pub (The Royal Arms), village hall, church and school. The majority of the housing sits adjacent to the road which runs through the village but a fair proportion is located on the various lanes which spur off this road. The village is represented on Llangarron Parish Council and administered at county level by Herefordshire Council. Population is approximately 520. Historical records are scanty, particularly before the 1600s because of the absence of industry, major ecclesiastical establishments, important trade routes, a big house and famous names, but this is not unusual in a small settlement which developed over many centuries of mainly subsistence farming. Llangrove is on a ridge four to five hundred feet high, without an easily accessible natural water supply, which would have made life difficult for those seeking to set up home here. 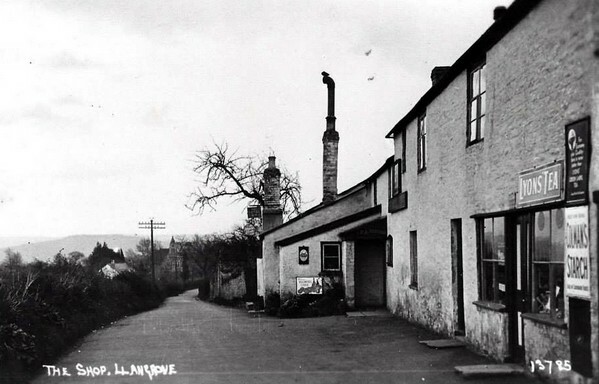 It was not until about 1880 that a public system was provided: water was pumped up from the river Garron to a holding tank at the top of the village, in what is still called Tank Meadow, and distributed through seven roadside taps like the one outside the school which commemorates Queen Victoria’s Golden Jubilee of 1887. 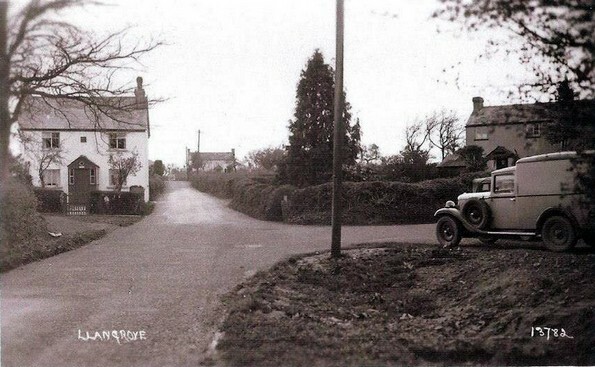 Llangrove has never been short of names: Langrove, Longrove, Longgrove, Long-grove, Long Grove, Llangrove Common were all in overlapping use into the 1950s. Evidence suggests that the present name was fixed some time around the 1920s by a Ross postmaster on the assumption that one llan is the same as another. But Llangrove is not a Welsh llan, which implies an enclosure with a church or other sacred place. The first known mention is in 1372: 'Longegroue' (actual spelling) is noted as having underwood of 100 acres cut for charcoal every nine years. In 1602, George Kemble was sheltering a Jesuit priest in 'Londgrove'. The village lies in the ancient district of Archenfield, an area originally under the control of the eighth-century King Offa of Mercia – he of the dyke. He tolerated Welsh customs, language and religious practices here, hence the llans and churches dedicated to saints such as Deinst and Dubricius on what is now the English side of the border. Llangrove had a church of its own, called Glynston Chapel in the archaeological record, located in the south west corner of the village, but Taylor’s 1754 map of Herefordshire shows it as a ruin. Congregational and Methodist chapels were well established by the middle of the 1800s and were active for over a century. 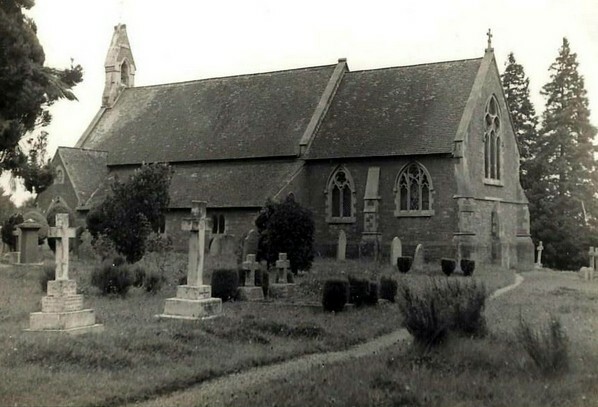 Christ Church (Anglican) was completed in 1856. Looking back two centuries or so, we would recognise the shape of the village with its maze of lanes and scattered houses, the unmistakable sign of settlement on common or unenclosed land. There were already a few older houses dating back to the 1500s and 1600s, and by the mid 1800s the village was becoming self-sufficient. Trade directories later that century list builders, tailors, a wheelwright and a blacksmith, carriers, an undertaker, bootmakers and plenty more. There were three shops, two (possibly three) pubs and, well into the 20th century, regular bread, fish and meat deliveries. Llangrove Transport ran seaside excursions and a frequent daily bus service to Ross and Monmouth in the 1920s. Up to World War I, the church registers show that occupations were mainly agriculture-based, but this starts to change as miners, railway shunters, roadmen, a constable, a ship’s carpenter, a nurseryman, engineers, and a ‘gentleman’ are listed, suggesting diversification of population, mobility and increasing employment opportunities. By the 1960s new residents were starting to move in from further afield, some to work locally or in places like Hereford and Gloucester, having turned their back on the cities or choosing to work from home. Completion of the A40 dual carriageway in 1965 gave a fast link to the expanding motorway system, specifically London via the Severn Bridge and M4, and increasing car ownership brought villages like Llangrove within reach of many people attracted by the idea of country living and being part of a small community. 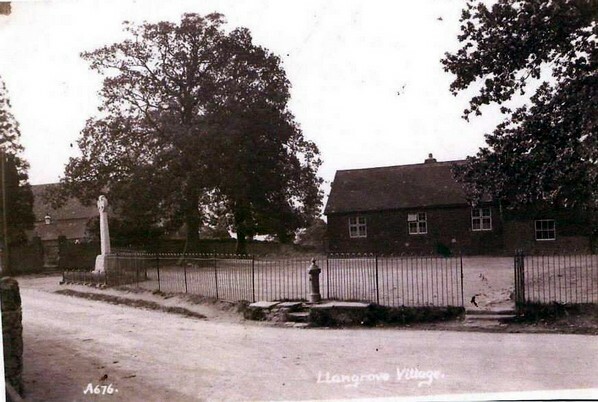 But we have still not answered the question: How old is Llangrove? We probably never will, but consider this... in the 1870s, a Treduchan ploughman turned up an Early Bronze Age burial chamber with skeletons. It was a ceremonial, not a casual burial, and it took place between 3500 and 4000 years ago. People of this era were farmers, capable of animal husbandry, crop planting and tool and pottery making. Were they among the first to size up the ridge on which the village now stands as a possible place to clear their small fields, set up home and raise their families? It is possible, even probable, but we can say no more than that at the moment.